Devastated Mansfield Town manager David Flitcroft has spoken out on the bad injury-time tackle that left Hayden White with a suspected broken ankle. The injury took the gloss off the Stags’ terrific fightback to win 3-2 at their fifth-placed promotion rivals, Colchester United, as they remained third in League Two. White was the victim of a rough challenge by Frank Nouble in injury-time that left the Stags wing-back on a stretcher. “I feel numb. He [White] has come walking into the dressing room with probably a broken ankle, we think. It’s a 99 per cent probable broken ankle,” said Flitcroft. “It just worries me. The game worries me. There has to be a duty of care [from referees]. That’s what you’re out there for, their first thing is to manage situations. Flitcroft was unahppy with the performance of the referee, which he thought contributed to the bad challenge that earned Nouble a yellow card. “The management of the game from minute one until 96, you could feel it coming. 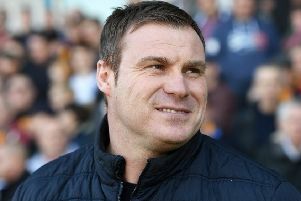 I could feel something going on,” said Flitcroft. “The players tried to control themselves but the referee didn’t have the last 15 minutes of the game [under control]. “The players are the most important people on the pitch. “Even though we’ve had a win, it’s taken the shine off it. All my thoughts are with Whitey. “What he has put into his game and how he is trying to improve. He’s just had a baby and his family who I care about, I’ve got that to think about now. “It’s part of the game and we all understand that, but it could have been prevented with better game management, referee management. It boiled over and it didn’t have to. “We’ll go get him [White] an X-ray and get him comfortable. We’ll get him in a good place, as good as we can, and then work from there. “The dressing room is low, with Whitey coming in there. He means a lot to them, because he’s a leader.